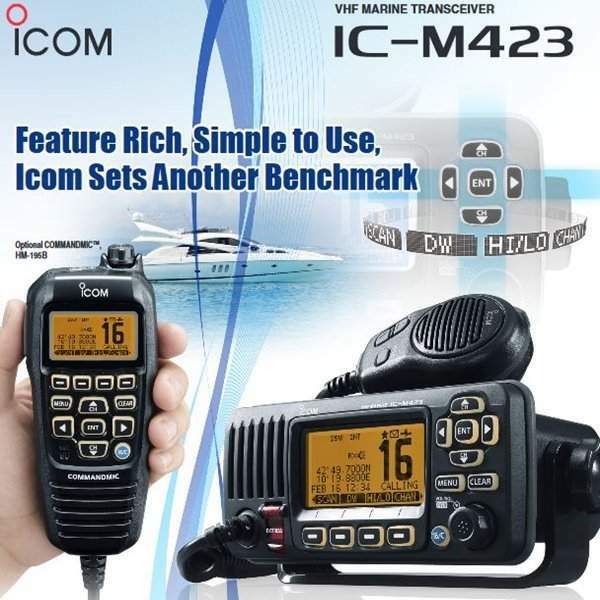 The IC-M423 is Icom’s next generation VHF/DSC has a new user interface which makes driving this Icom fixed mount incredibly simple. This compact radio features Active Noise Cancelling Technology that reduces background noise by 90%. Packs 10W from its loud speaker making sure your calls are clearly heard. The IC-M423 also has a Public Address & Fog Horn function so when attached to a hailer horn will expand the usefulness of this new radio. 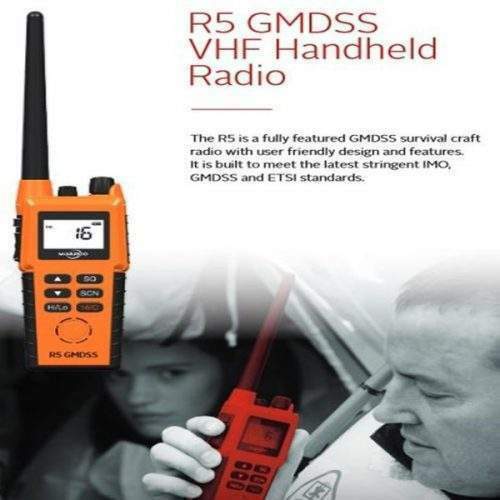 IC-M423 has easy to use interface that incorporats into future Icom radios. The common Marine Family User Interface provides simple operation for the boat owner. A rotary selector, directional keypad provides intuitive operation. The high definition dot matrix display allows all information to be clearly viewed. The built-in DSC watch function monitors Ch. 70 (DSC channel) activity, even while you are receiving another channel. 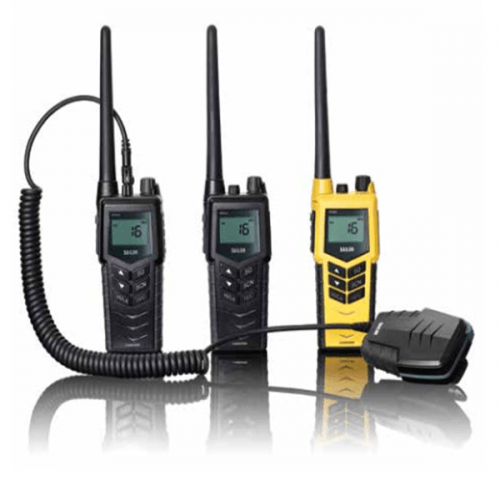 DSC functions include: distress, individual, group, all ships, urgency, safety, position request/report*, polling request* and DSC test calls. When connected to an external GPS receiver, current position and time are shown on the IC-M423’s display. 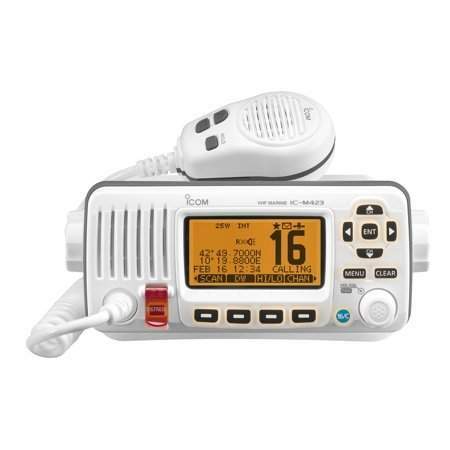 When receiving position information from another vessel, the IC-M423 can transfer it to a navigational device via NMEA 0183 connectivity. 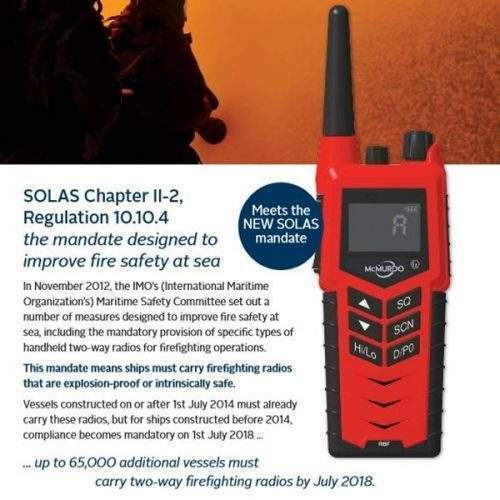 Integrat with the Icom’s MA-500TR Class B AIS Transponder allows you to transmit DSC individual calls to a selected vessel instantly without manual MMSI entry; very handy if you are waiting to contact vessels on the AIS screen, an essential safety feature in an emergency.